The plight of the 63,000 refugees and migrants still marooned in Greece should give Europeans pause for thought. In a cave below the remains of a mile-long city wall, a small band of freezing and utterly exhausted men had manged to get a fire going. Outside, the wind was turning vicious. It felt like even the ocean was exasperated, splashing onto the cliffs as if trying to smash through the huddling men’s final illusions. Seeing how these fantasies were already so few and far between, it seemed a rather daunting task, even for an ocean. Dusk was descending over the damp stone cave in Greece. True, it was somewhat less cold inside, but the men were still shaking like leaves. All of them were Algerian migrants placed at the bottom rung of the food chain here on the modern-day Medusa raft set afloat by the European anti-refugee and anti-migrant policies. In the moments of relative calm before the wind picked up again, no one much felt like talking. These men had long lost their flair for chatting, and most of their hope had been buried back in the Sahara, in Turkey and somewhere at the bottom of the Mediterranean Sea. The rest of the metaphorical mortgage on their future had been foreclosed by the European bureaucrats. By now, the refugees’ stories had become etched on their faces, especially around the eyes. Gazing back at me were the hopeless, worn-down eyes of men who had played the game and lost so horribly they could no longer afford to admit it. At the moment, some 63,000 refugees and migrants are marooned in Greece, unable to either forge on to the promised land or return to their respective conflict zones. For months, thousands have been waiting for their first interview after applying for asylum. Many have already had their application turned down. In reaching that decision, the local bureaucrats had decided that Turkey – a country teetering on the brink of war – is a safe country for the refugees. The bureaucratic apparatus is excruciatingly slow to act. Its members, almost without exception, are ‘only fulfilling their duties’ and ‘obeying the law’. Their collective actions form a perfect algorithm for the banality of evil that has already led to the birth of a new Europe, a morally bankrupt continent stripped of its last vestiges of shame and empathy. The Eastern Aegean island of Chios has been described as the “magical Greek island which cures all wanderlust”. It is also one of the frontlines of Europe’s war against refugees and migrants. For a long time, the local population on Chios distinguished itself with its exemplary and at times heroic care for the incoming refugees. Then last spring, after the EU-Turkey deal on refugees was struck and the Balkan route shut down, the Greek authorities under Brussels patronage set up the infamous “VIAL hotspot“. The first of many, the VIAL was a mix of prison and latter-day concentration camp – vile like its acronym. In no time at all, similar facilities sprung up on many Aegean islands located near the Turkish coast. Some hotspots have also been set up on the mainland. Like the Moria camp on the Lesbos island, quite singular in its combination of inhuman living conditions and police brutality, the VIAL is by far the most notorious. On my first visit last April, the entire camp seemed poised on the brink of an explosion. A hunger strike was underway, and the authorities were struggling to quiet things down by relocating hundreds of people to the Souda camp. 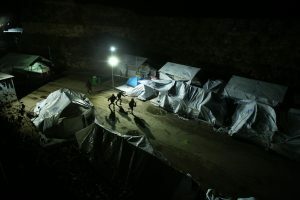 The improvised camp was located by the sea and close to Chios town. It was run by a coalition of NGOs, whose activists brought food to the refugees and helped them with the horrendously intricate paperwork. Nine months ago, the fresh arrivals to the island were still filled with hope, enthusiasm and the will to thrive. They had somehow managed to survive both the devastation of their respective homelands and the infinitely treacherous journey to what they thought was the civilised world. Slogging through endless humiliations while grappling with the fact their entire past had been erased, they whole-heartedly gave themselves up to the present to find a semblance of a future. Today, with Fortress Europe closed off and most of its lustre as the land of refuge and opportunity trampled in the dirt, things are very different. True, many of the refugees managed to strike on to Athens, and some of them even further on. 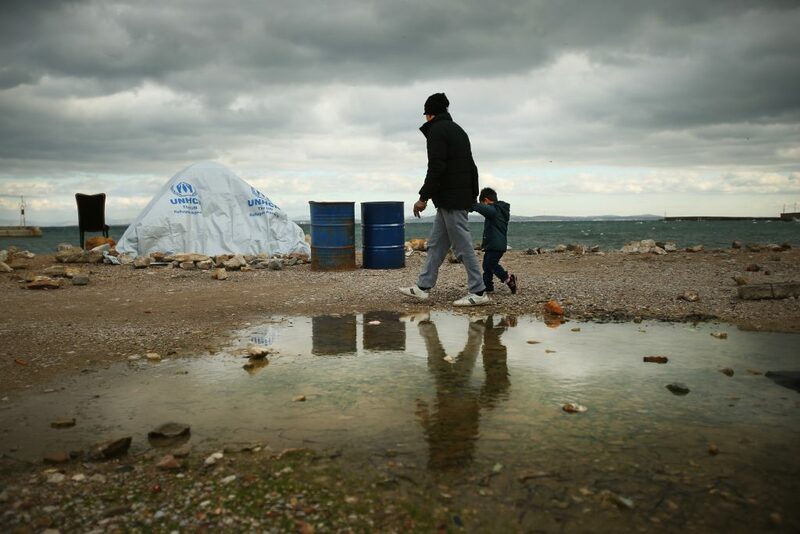 But on Chios, hundreds of people have been trapped in such shocking conditions for months. The mornings in front of the Souda camp see dozens of refugees come out to kill some time. The camp is situated right by the sea, beside a long canal along the ancient city walls. The men are conversing quietly and without much enthusiasm. Most of them don’t even seem angry anymore. The muddy and bitterly cold camp has been ransacked by the flu. But even worse has been the epidemic of depression – the collective form of the disease, in firm alliance with the symptoms of what is so clearly post-traumatic stress disorder. Nine months ago, one could still discern much empathy among the locals, even though the refugee crisis had already deprived them of their tourist-based income. But since then, things have taken a sinister turn. Both empathy and hospitality have a limited shelf-life, at least when not actively cultivated. 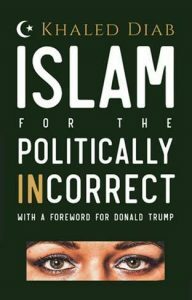 The masks of political correctness have now fallen, and long-dormant Nazi sleeper cells are stirring back to life. As ever, the weak and the downtrodden are bearing the brunt of it. Less than two months ago, rocks and Molotov cocktails rained down on the refugee camp. The message couldn’t have been clearer: the island is no longer safe for the refugees and the migrants. In the nine months following his arrival at Chios, Mustafa E became one of the most recognisable faces on the island. His excellent English and distinct flair for companionship have made him the favourite both of his fellow sufferers and many foreign activists. Yet the robust 42-year-old’s fixed smile cannot fully conceal his pain. After losing his wife and two children in an Aleppo air raid, Mustafa hasn’t really stopped moving. Even here, in the Souda camp, where he lives in one of the huge tents bearing the UNHCR logo, he gets frequent flashes of paranoia. He literally can’t keep still. When he tries to do so, he gets utterly crushed under the weight of his loss. His family is the one thing he refuses to talk about. Everything else he is all too eager to discuss in an often unstoppable and obsessive fashion. Apart from flashes of his war-torn land, he is also haunted by the future. For what future can there be for one of tens of thousands of faceless refugees here? And in Greece, of all places – a country once again sacrificed on the altar of Europe’s opportunist agenda, conscripted to serve as the continent’s human waste dump? The answer, Mustafa feels, is all to apparent. I was talking to Mustafa in his very poorly heated tent. The words kept pouring out of him like a feverish litany. This man so clearly and so badly needed to state his case. Before the ground opened up beneath him and swallowed his entire existence, Mustafa Alkhtyibe was the head of a successful marketing firm in Aleppo. But as soon as he started describing his life back then, he all but fell apart with despair. From then on, all he could manage were short, sometimes almost completely unrelated sentences detailing his plight. His most immediate problem right now was that the Greek authorities had denied his application for asylum. He had already appealed the decision, and had lost the appeal. After all, the European and Greek bureaucrats happen to feel Turkey is perfectly capable of providing safe haven. In Mustafa’s case, being single proved a further factor against him. The fact that the war robbed him of his entire family had made him even more undesirable than he would have otherwise been. And the local paper-shufflers were equally unswayed by the fact that his beloved city of Aleppo had been razed to the ground. Mustafa was serious about getting out. Every day I spent with him served up its own plan, each one more fantastical than the last. One morning it struck him that his best chance for smuggling himself onto a ferry for Athens would be to bring a small dog. All the attention would be diverted to the dog, Mustafa reasoned, while he himself might go completely unnoticed. Mustafa also told me the traffickers have an actual menu. Business is booming, and one can get anywhere one wants, as long as one provides the currency. Canada – €9,000, Germany – €3,500, France – €5,000, Great Britain, €7,000. With a violent sneeze, Mustafa poured himself another coffee. It was possibly his tenth that day. The problem is that he doesn’t get much sleep at night, so he broods and scours the internet for possible solutions. In the morning, he would give anything not to get out of bed. “As soon as I get up, I start losing money,” he winces and finishes the coffee. A large crowd had gathered in front of the Souda camp. The men were lining up for food, focused on getting their daily rations and bringing them to the women and children waiting somewhere further back. These mealtime conflagrations have long become the emotional fulcrum of camp life, offering the only solace to a radically impoverished existence. Omar was kept busy with his studies and with his job waiting tables at a restaurant. His greatest hope was for the war to end before he completed his university education. That would free him from the ever-looming prospect of getting conscripted into the army, where he would have to kill friends and neighbours in the vilest armed conflict of our generation. But it was not to be. When Omar graduated, the carnage had only just begun in earnest. As a Sunni in a Shiia-dominated town, he felt much too exposed to even think about staying. He certainly didn’t feel like helping a thoroughly discredited regime butcher tens of thousands of its own citizens. His other option – to throw his lot with the extremist-controlled Islamic militias – seemed just as unappealing. So he struck out for Quamishli, a Kurdish town next to the Turkish and Iraqi border. Even though his parents had been residing there for a while, the town wasn’t safe for him. The members of the YPG Kurdish militia, which controls a large part of northern Syria, weren’t exactly welcoming to a fighting-fit Sunni Arab. And so Omar opted to follow the lead of his two brothers who, eighteen months ago, had braved the gauntlet of the Balkan refugee route to reach Germany. The expensive help of the local smugglers got him through the heavily guarded border, where dozens of refugees had recently been gunned down by the Turkish border patrols. Omar didn’t have enough money to purchase ‘the classic’ on the smugglers’ menu. So he was forced to make do. The smugglers got him a free place on one of the outgoing boats, but in exchange he was tasked with steering it himself all the way to Greece. Little did he know that his assent could very easily have landed him in jail as a sub-contractor for the smugglers. It was equally likely he could have proven unequal to the task of navigating the motor boat. He had never before attempted anything like it in his life. For the boat’s 35 passengers, the consequences could have proved fatal. Omar, too, is one of those dejected souls whose application for asylum has already been turned down by the Greek authorities. He is now awaiting the decision on his appeal, but the most likely outcome by far is that he, too, will soon be deported back to Turkey. This is all part and parcel of the EU-Turkish deal. Yet in the gathering dusk over the bitterly cold refugee camp, he told me he still refuses to lie down and accept defeat. He had already risked too much to do so. He informed me he was the only person on his boat who had not yet managed to leave Chios. He takes this as proof that it is still possible to reach at least Athens if not the actual promised land. But reaching the Greek capital would set him back €500, and he has no money left. His parents are unable to help him. Perhaps the two brothers will be able to chip in if and when they make any money. Omar proudly informed me they had both been granted asylum in Germany and were doing very well. More than anything else, this young Syrian seemed terrified of losing hope. Hope, after all, is the chief driving force for the traumatised survivors in camps like these all over the Greek coastline. Small wonder then that the European bureaucracy has long been waging a monstrous campaign to confiscate every last shred of hope and rob the incomers of the will to press on. “I could never have imagined I would witness such horrible things – such utter degradation of human life,” says Sharif Alimi, 28, an Afghan Hazara from the Gazni province. I got talking to him as he was boarding the ancient bus regularly transferring the refugees and the migrants between the VIAL hot spot and the Souda camp. For the previous five years, Sharif had been living in Sweden. But in November he decided to return to Greece, which had served as the first European port of call on his long and arduous path to freedom. The reason for his recent return? Two months ago, his parents arrived to Chios after spending the last years as refugees in Quetta, one of the most dangerous cities in the world for the brutally persecuted Hazara people. When he got word his parents had arrived in Chios, Sharif managed to put his good job in Sweden on hold and immediately departed for Greece. After hearing less than half of it, I was convinced Sharif’s story was worth a trilogy of both books and movies. During the 11 years of being Europe’s plaything, he was deported to Afghanistan, Turkey, Greece and twice to Iran. Giving up was not an option. He was treated to an insider’s view of the various flavours of Slavic policemen, the savageness of life on the Italian streets and the recent build-up of French racism. He was only accepted by Sweden a little over five years ago, and he says the Scandinavian country has been very kind to him. He was quick to get a job, which enabled him to get the rest of his life in order. Today, this would no longer be possible. As reported, Europe is now repatriating Afghan refugees daily, declaring them safe in a land which has scarcely seen any respite from butchery for the past 40 years. Foregoing the option to sleep in a hotel, this dutiful son has been spending his nights with his parents inside the VIAL hotspot. Every single day he has to crawl in through a hole in the fence that is the best-kept secret around these parts. The VIAL hotspot is otherwise heavily guarded, but once Sharif manages to slip inside, no one finds him particularly suspicious. Talking to him, it soon became clear he has little interest in comfort and is totally committed to his goal. He had been through everything and more; his pain threshold has been raised to a previously unimaginable level. Once you get to know him, you can so clearly see it written in his face, the scarred and grizzled visage of a true survivor. In the days we spent together, Sharif and his Swedish girlfriend Zara did everything in their power to relocate the parents to a hotel. Omar was set on providing his mother and father with at least a modicum of comfort and dignity, even if it meant running the risk of himself being jailed again. He was both dignified and fearless in fighting off the policemen and fellow migrants out to humiliate his parents. Without his Swedish passport, Sharif would be quickly and literally vanished from the continent. As things stand, he could clutch this tiny piece of paper and keep fighting for that elusive and infinitely fragile thing called human rights.